Located in the heart of Baldock, a historic market town, The George coaching inn dates back to the 15th century. The inn was renovated in 2013 to create a modern eatery showcasing contemporary British and European cuisine. The restaurant bar, voted one of the top cocktails bars in the county by Hertfordshire Life boasts a variety of cocktails to suit any mood. Our emphasis is on fresh, seasonal food cooked to order with ingredients sourced from local farmers and suppliers. 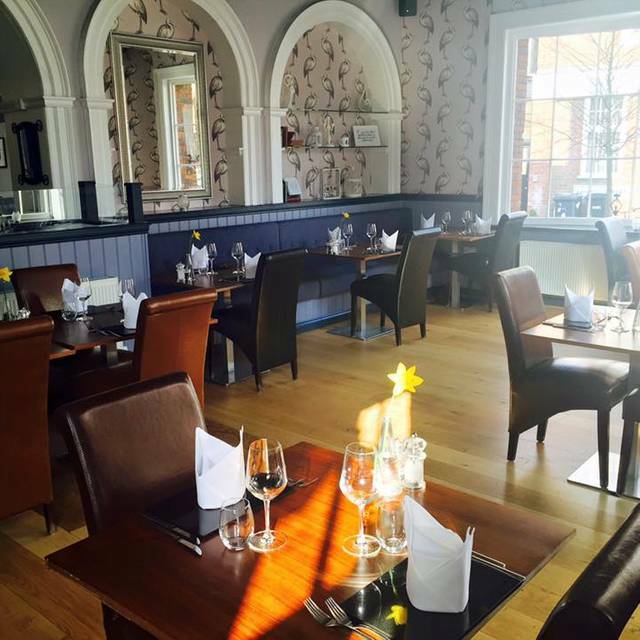 Enjoy our bright and airy restaurant which retains many of the building"s original Georgian features complete with an open plan kitchen. Lovely place but disappointing food. Over priced for the quality and appearance of the food provided. Good atmosphere and welcoming though! The food was lovely but for a Saturday lunchtime the menu was very limited. We did ask if there was another menu we could order from but that was the only one. The meals were a good size and good value plus the waitress was lovely. Food was okay. We had booked a table in the week to go for Sunday roast. Unfortunately when we arrived we were informed they had ran out of roasts which was a shame as there’s not much menu choice on a Sunday afternoon if you’re not choosing the roast so thy was a huge let down. Wouldn’t have minded so much if we hadn’t pre-booked earlier in the week. Very happy with everything staff friendly and helpful. Perfectly pleasant Sunday lunch at The George and would certainly consider dining there again. Staff were pleasant and efficient. My one slight quibble was that the crumble had too much fruit, not enough crumble and was hot beyond belief to the point I believe the flavour was impaired. It was eatable - eventually - but perhaps it is something that needs considering. Lovely evening in a nice atmosphere. Food was generally good, although service timing could have been a little better (graze plates should have arrived before starter instead at same time!). Wines were good and pleasant service. Will return! We all enjoyed our meals and the service was good and friendly. Went for Sunday lunch, which turn our to be the best we've had in a pub for a long time. Staff were all very friendly as well. We have been to the George a few times was hopping to have a different menu for the lunch or we didn’t realise the menu changed for lunch and dinner, we had a lunch but ended up good! The service was brilliant as always, the main course was very poor the lamb was tough and needed a steak knife to hack through it, would have made excellent shoe leather. I was really surprised because the food is normally to a very high standard, maybe just a bad night at the office. The place was buzzing, staff very attentive and lovely personalities. Food was above average but not exceptional. Two of us had the duck which was tough. Excellent food! One of my favorite places for Breakfast/Brunch, Lunch or Dinner. It is always a delight to dine at The George. We enjoyed a very nice meal with great service from friendly and attentive staff. A very pleasant Sunday afternoon for my sister's birthday. Cold veg, more fat than meal, drizzle of so called jus, ignorant rude staff, other than that fab !!! Attractive restaurant and a perfectly nice lunch, but not a place I would rush back to if I’m honest. Absolutely nothing wrong with it, just missed the element that would make me choose to go back. Very nice place to Sunday lunch. We were with dog and there was no problem for them. Good food and good service. Staff were very pleasant. We will be back! Fabulous place. The food was really lovely and plenty of it. We stumbled across The George while visiting family in Baldock and wanted a Sunday Lunch, Trip Advisor reviews were very good and we were not disappointed, the food was good, hot and well presented. Fab contemporary place to visit , looks like an older pub but isn't on the inside. Food great too. The waiting staff were poorly trained. Received the wrong menu and after 10 minutes they took that away. Had to wait another 10 minutes and called for the manageress who gave us the correct menu and the service she provided was fine. The food was average / below average. More training required all round to improve the experience to the level that would be expected from such an establishment. Followed by lamb wellington and steak they were all good as was the banoffi and panecotta. I had lamb wellington and it was absolutely wonderful. Would definitely recommend to eat here. However, was slow to get our drinks, but food made up for it. Very good service. Waiting staff very attentive. Tasty food too. Went as a party of 4 . All meals and service excellent. We will definately be visiting again soon. Pleasantly surprised, often walked past but had never been in. Nice, open restaurant, tables well spaced. Good selection of food and drinks. Waiting staff were very pleasant. Will certainly be going back. I went here for my daughter’s birthday. The staff were very attentive without being intrusive. The food was amazing as were the cocktails. Would definitely recommend this and will be going back very soon. Great food, lovely surroundings. Very friendly staff that made you feel welcome and that continued all the way through dinner and breakfast. We took our Dad here for Father's day, the staff are efficient and friendly and the Roast Beef Dinner I had was fantastic. We will def' be going back again! Lovely food and a very pleasant atmosphere.The waiting staff were friendly and attentive. The place was quite empty so the service was lovely and attentive even though we sat outside. Food was lovely and well priced- we had brunch food but the lunch also looked good!